Discussing the news articles for the week. Well, this is the week that the country really went into meltdown over the carrier bag fiasco, with people stealing shopping trolleys to wheel their shopping all the way home - into their living rooms, and proudly posting pictures on Twitter. 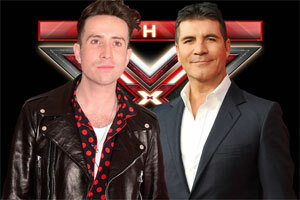 Simon Cowell comforts Nick Grimshaw and says he's trying his best, but people still miss Louis Walsh. Backlash. Simon Cowell got annoyed with contestant Mason Noise, who was a wannabe rapper on the show, calling him an A-hole and telling him to shut up. And then he threw his microphone on the floor. What an attitude! Probably wasn't as good as our new microphone anyway. Good riddance to bad rappers. Len Goodman, head judge on BBC's Strictly Come Dance got very cross and shook his finger at one of the dancers, after they performed to Sam Smith's Writing's on the Wall. Ooh, by the way, we're reviewing that song next week, as the new James Bond film is coming out then. We're not sure exactly what Len Ten said, but we think he was cross because it sounded like Michael Jackson's Earth Song. You're not the only one Lenny. Dishy Harry Styles from One Direction, the one with the flowing locks, got a parking ticket when he popped to the shops. Let's hope he can afford to pay the fine. Think he'll be alright there. Nia - someone my mum knows saw Harry Styles the other day and said he was quite tall. 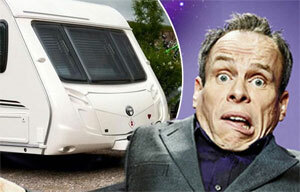 Poor Star Wars actor and star of the Harry Potter films, Warwick Davis has had his caravan stolen from his home in Cambridgeshire and has taken to Twitter to get the whole country to look out for it, so if anyone has seen a white caravan with windows on the side, being towed down the motorway this week, let Warwick know. I think it is got a door in the side as well. Chris Moyles tried to blag him one this week on his radio show, in exchange for advertising. So, if there is anyone out there with a caravan who wants a plug on the NiliPOD, email in right now please and we'll also give you a Mars Bar to say thanks from us, and lots of publicity.